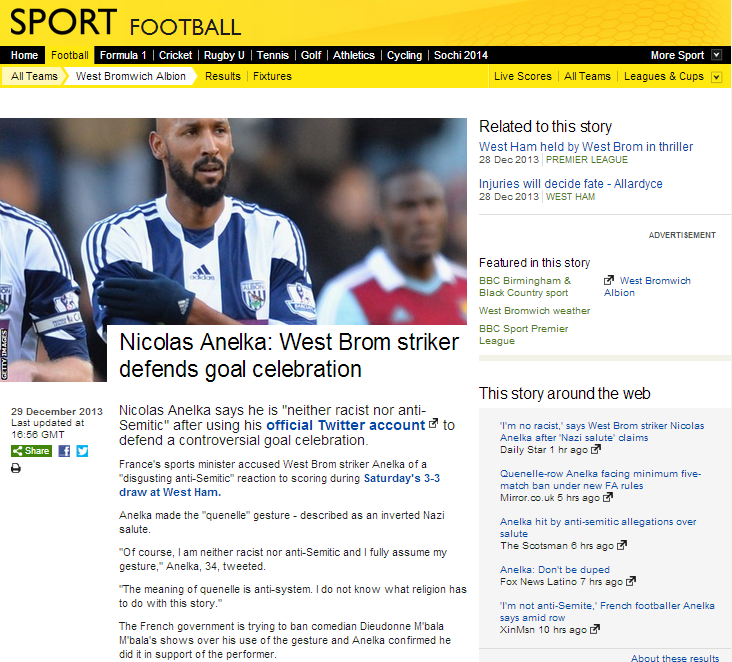 On December 29th the sports section of the BBC News website published a story titled “Nicolas Anelka: West Brom striker defends goal celebration“. The article opens with amplification of Anelka’s reactions to the criticism levelled against him as a result of his having used what is widely regarded as a neo-Nazi salute during a live-televised football match the previous day. 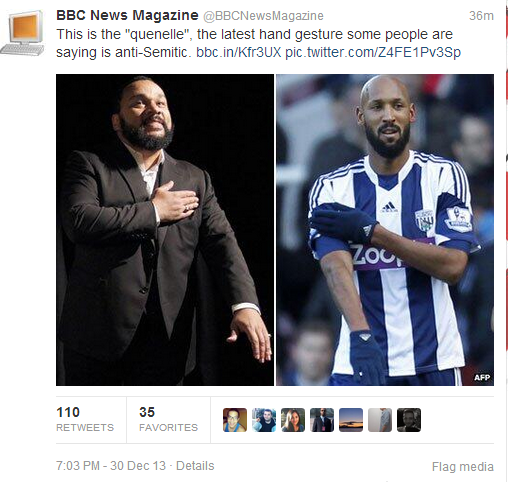 Anelka made the “quenelle” gesture – described as an inverted Nazi salute. “Of course, I am neither racist nor anti-Semitic and I fully assume my gesture,” Anelka, 34, tweeted. “The French government is trying to ban comedian Dieudonne M’bala M’bala’s shows over his use of the gesture and Anelka confirmed he did it in support of the performer. The BBC’s claim that the concerns of the French government are confined to Anelka’s friend’s “use of the gesture” of course whitewashes the fact that the ‘comedian’ who has made a career out of antisemitism has a long history of brushes with the French authorities because of hate speech and racial incitement. “Nevertheless, on the eve of Anelka’s celebration, French Home Office minister Manuel Valls had indicated that he was looking at ways to ban Dieudonné’s ‘shows and public meetings’ after the comedian’s latest anti-semitic tirade, which had been directed at journalist Patrick Cohen. Quote-unquote: ‘when I hear him [Cohen], I tell myself, you know, gas chambers…too bad’. If Anelka’s quenelle was indeed nothing but a show of solidarity with a friend who’d found himself embroiled in trouble, it’s just as well we know what kind of trouble that is; and it’s not as if Dieudonné had no ‘previous’ in that department. He’s been found guilty of incitement to racial hatred on several occasions, his first condemnation coming in November 2007 after making the following comment: ‘All of them [Jews] are slave-straders who’ve moved into banking, show-business and, today, terrorist action’. The BBC article also amplifies the uninformed reaction of Anelka’s club’s manager. “Albion caretaker manager Keith Downing said Anelka was “totally surprised” by the furore, despite the French government announcing on Friday that it was studying legal options to ban performances by Dieudonne. Given that the target audience of this report is for the most part unlikely to be well versed on the subject of antisemitic trends in some of the darker corners of French social media and considering that this offensive trend appears to be spreading in the sporting world, it is especially regrettable that BBC Sport has wasted the opportunity to adequately clarify the background to the controversy surrounding Anelka’s action to BBC audiences, instead opting to amplify assorted excuses and downplay the antisemitism of Anelka’s racist friend. But it is not just writers at the BBC’s Sport department who is apparently afflicted with the inability to recognise antisemitism when it stares them in the face. On December 30th the Tweet below was sent from the BBC News Magazine account. The Tweet promotes an article appearing on the BBC News website under the title “Who, What, Why: What is the quenelle gesture?” which describes the gesture’s inventor as having run an “anti-Zionist” campaign in the 2009 European elections and apparently seeks to perpetuate the myth that antisemitism is only to be found on the far-Right of the political map. “Dieudonne instead inverts this to argue, as we heard in the 1930’s, and again more recently, that a powerful Jewish lobby is now “controlling” the system. It is distinctly disturbing that – once again – the BBC cannot find similar clarity of perspective on the subject of antisemitism. If your wage as a footballer is €1.2m I suggest you are part of the ‘system’. Nice try.